Forwardkeys, which provides analysis on airline bookings, recently reported seeing a sharp uptake in bookings with a stopover at Istanbul Airport and a decline in passengers booking via Abu Dhabi in the first quarter of 2018 compared to the same period a year earlier. Was this the start of a positive trend for Istanbul Airport, and a welcome development in the light of the new airport opening later this year? We’ve taken a look at the latest OAG traffic data to see how passenger traffic has been evolving at these two airports as well as the other major Middle East hub airports at Dubai and Doha. It’s clear that Hamad International Airport at Doha (DOH) has taken a hit due to the flying restrictions imposed by neighbouring countries Saudi Arabia, UAE, Bahrain and Egypt on Qatari-registered aircraft using the airspace. The blockade began in June 2017 and every month since then the number of passengers transiting at DOH has reduced further. 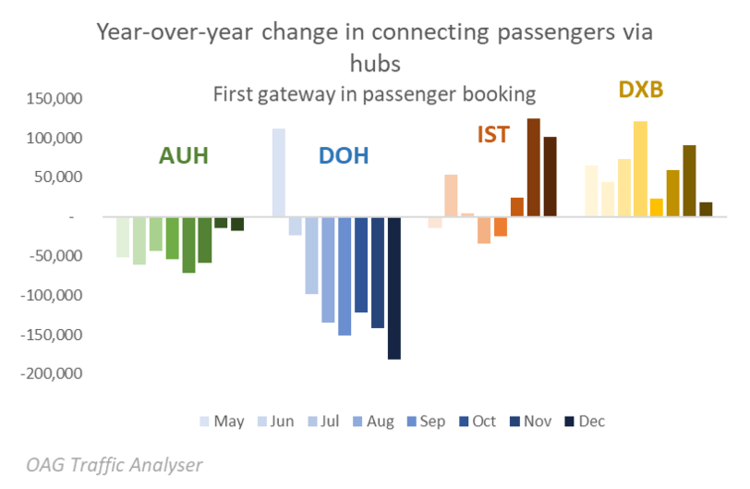 The latest preliminary data for December 2017 suggests that around 180,000 fewer passengers connected via DOH than in December 2016. The prime beneficiary appears to have been Dubai International Airport (DXB) which has seen the volume of connecting traffic rise year-over-year, with an average of 61,000 more passengers having DXB as the first gateway point on their itinerary since June. However, we could be seeing the beginning of a trend with Dubai connections falling as those via Istanbul Ataturk Airport (IST) rise. In both November and December 2017 connections via IST were over 100,000 higher than the same month in the preceding year. Capacity at IST in those months was up by 9.2% and 8.4%, respectively, significantly more than in the preceding 10 months given that over the course of 2017 overall capacity was very slightly down on 2016 (-0.3%). It may be too soon to say what is driving the increase in connections via IST and it could be due to any one of a number of factors – general capacity increases, passengers avoiding other airports, attractive through fares, or positive passenger experiences at IST, but it’s certainly one to watch. With capacity continuing to grow, and 9% more scheduled airline seats expected at IST in the first quarter of 2018 compared to a year earlier, the airport is clearly getting ready for the day when there is capacity to spare.